After an unrelenting start to 2019, the Easter break provides a rare opportunity to take stock of where things stand with Brexit. But while some U.K. MPs have already headed off for some much-needed rest, leaders in the European Union are imploring them to find a way forward. On Tuesday, European Council President Donald Tusk summed up the mood, admitting that everyone is growing tired of the protracted divorce while warning politicians in the bloc and the U.K. to keep trying to break the deadlock. That fatigue should come as no surprise. Since the start of January, Prime Minister Theresa May’s deal has been rejected three times, the government has suffered numerous defeats and resignations, the symbolic March 29 exit date has come and gone and the U.K.’s departure deadline has been pushed back twice. Meanwhile, the prime minister has survived a confidence vote in her government, endured hours of talks with the EU, been battered by questions in Parliament, entered into negotiations with her biggest rivals and promised to quit if her deal does eventually pass. Still, we’re not any closer to knowing what Brexit will eventually look like. And although the latest extension, until Oct. 31, has seemed to take much of the heat out of the debate, U.K. politicians know they may face an equally tumultuous road ahead when they return to Westminster later this month. Speaking in the same chamber as Tusk yesterday, European Commission President Jean-Claude Juncker echoed the call for action, although he put more of the onus on Parliament. The answer “will have to come from London, and the earlier the better,” he said. But probably not in the next few days. So, like the politicians in Westminster, the Brexit Bulletin is taking an Easter break. Thanks for staying with us through a busy period. We’ll be back next week. The delay to Brexit is fueling a U.K. booking frenzy for holidays on the continent, according to Lucca de Paoli and Ellen Milligan. Some of the climate protesters who blocked traffic across London for a second day on Tuesday blamed the U.K.’s exit from the EU for pushing the environment down the government’s agenda, Alex Morales reports. “Brexit is a distraction from the real issues,” said Bryn Raven, a 75-year-old yoga teacher from Suffolk. Labour leader Jeremy Corbyn says talks with the government are stalling due to a Tory desire for post-Brexit deregulation, according to the Guardian. A spokesman for the party later denied the negotiations had broken down. Beyond Brexit | As the European Parliament this week holds its last plenary session before the May 23-26 elections, here’s a look at some EU actions during the current term slated to be felt far beyond the Brussels bubble and long after any actual U.K. withdrawal from the bloc. Carbon Woe | The U.K. budget is already falling victim to Brexit-related trouble in the carbon market. The government might have lost as much as 500 million euros ($566 million) in revenue in the first quarter after auctions of emission permits were frozen, according to estimates by the International Emissions Trading Association. 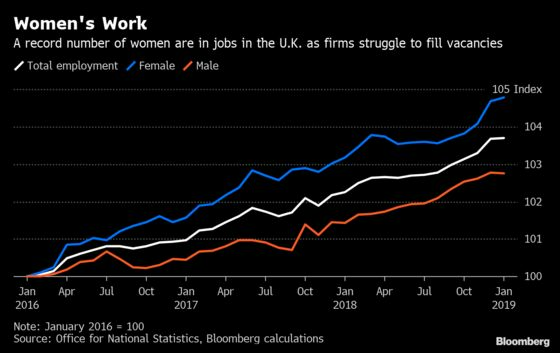 Jobs Growth | The U.K. labor market continued its impressive performance in the three months through February as employment jumped and wage growth far outpaced inflation. Women, in particular, are enjoying an employment boom, accounting for almost 80 percent of the 179,000 jobs created in the period. Another Vote | Veteran MPs Frank Field and Kenneth Clarke are planning a motion to give lawmakers another vote on a customs union with weeks, the Evening Standard reports. NTT Move | Nippon Telegraph and Telephone, Japan’s biggest telecommunications company, is considering London for its new international headquarters, even as the U.K. remains mired in Brexit uncertainty.